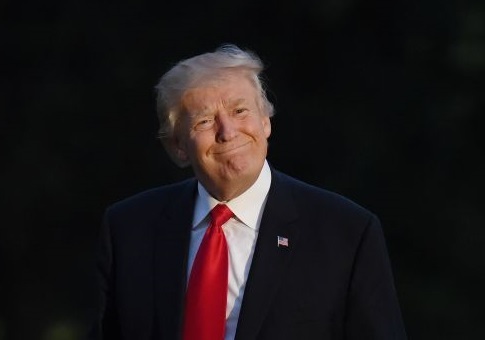 President Donald Trump's proposed budget for 2018 would reduce the deficit over the next decade by $160 billion and increase GDP at the same time, according to an analysis from the Congressional Budget Office. Trump's budget proposes a cut back in mandatory and discretionary spending that would not only reduce the deficit, but the debt as well. Relative to the size of the economy, federal budget deficits are projected to decline by 2.6 percent to 3.3 percent of gross domestic product over the next 10 years. This would mean that the deficit would be roughly one-third smaller than it was originally projected to be. Trump's budget also aims to reduce the debt to 80 percent of GDP, which is 11 percentage points below the budget office's baseline. By the end of the next decade, debt held by the public is projected to decline by 0.6 percent of GDP. The budget would reduce mandatory spending by roughly $2 trillion, which includes cuts to health care spending, student loans, and spending on income security programs. "The largest savings—$1.25 trillion over the 2018-2027 period—would stem from the proposal to repeal and replace the Affordable Care Act," the budget office explains. "Additional 10-year savings of $610 billion would result from changes to the Medicaid program." The budget would also lower discretionary spending by roughly $1.9 trillion, which would cut appropriations for nondefense programs. However, Trump plans to increase defense discretionary programs by $668 billion (roughly 5 percent). Two additional proposals by Trump would also decrease revenues. Trump plans to reduce appropriations for Internal Revenue Service enforcement by $19 billion, and air traffic control would be privatized, which would reduce revenues by $10 billion. Finally, because Trump's budget is projected to cut the deficit and increase public saving, GDP is expected to grow by 0.1 percentage point from 2018 to 2027. The budget office projects that, compared with its baseline, GDP would be roughly 0.7 percent higher in 2027. "The lower federal borrowing, relative to that projected under current law, would increase national saving, domestic investment, and the capital stock, thereby boosting output and income slightly and lowering interest rates somewhat," the budget office explains. "As a result, average growth in inflation-adjusted GDP over the 2018-2027 period would be about 0.1 percentage point higher under the President’s proposals than under CBO’s baseline. GDP would be little changed through calendar year 2021 and 0.7 percent higher in 2027. Those economic effects would help reduce the deficit." This entry was posted in Issues and tagged Budget Cuts, CBO, Deficit, Economic Recovery, Economy, Federal Budget. Bookmark the permalink.